Graham, who has staunchly defended Saudi Arabia in the past, did not provide any evidence to support his claim. Sen. Lindsey Graham on Tuesday blasted Crown Prince Mohammed bin Salman, the putative leader of Saudi Arabia, over the disappearance of Jamal Khashoggi, calling him "a wrecking ball" and alleging without citing evidence that he had the missing journalist "murdered." "This guy is a wrecking ball, he had this guy murdered in a consulate in Turkey, and to expect me to ignore it, I feel used and abused," the South Carolina Republican said on "Fox and Friends." Graham, who had previously been a staunch defender of Saudi Arabia, did not provide any evidence to support his claim that the crown prince is responsible for Khashoggi's disappearance. 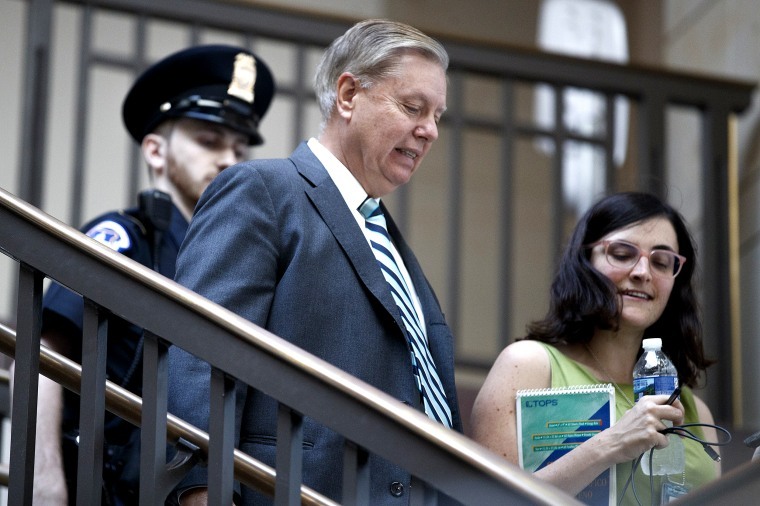 Graham urged President Donald Trump to “sanction the hell out of Saudi Arabia" and said bin Salman, who is often referred to by his initials, MBS, has "gotta go." "We deal with bad people all the time, but this is in our face. I feel personally offended. They have nothing but contempt,” he said. Graham then turned to the camera and said, "Saudi Arabia, if you’re listening, there are a lot of good people you could choose, but MBS has tainted your country and tainted himself." Graham’s comments come just a day after NBC News, citing three people with knowledge of the situation, reported that Saudi Arabia’s government is discussing a plan to admit that Khashoggi was killed after entering the Saudi consulate in Istanbul, Turkey. According to two of the individuals, the Saudis are putting together an explanation that would absolve the crown prince of responsibility by giving him plausible deniability to say he didn’t order the killing and didn’t know about it. Khashoggi, a Saudi citizen and critic of the government who wrote for The Washington Post, vanished on Oct. 2 after entering the Saudi consulate in Istanbul, triggering a major diplomatic crisis for the kingdom. Turkish authorities have told U.S. officials that they have recordings from inside the Saudi consulate in Istanbul that provide evidence that the missing journalist was killed inside. NBC News has not heard or seen any purported recordings. Secretary of State Mike Pompeo met with Saudi King Salman and bin Salman in Riyadh on Tuesday to discuss the disappearance and alleged murder of Khashoggi.